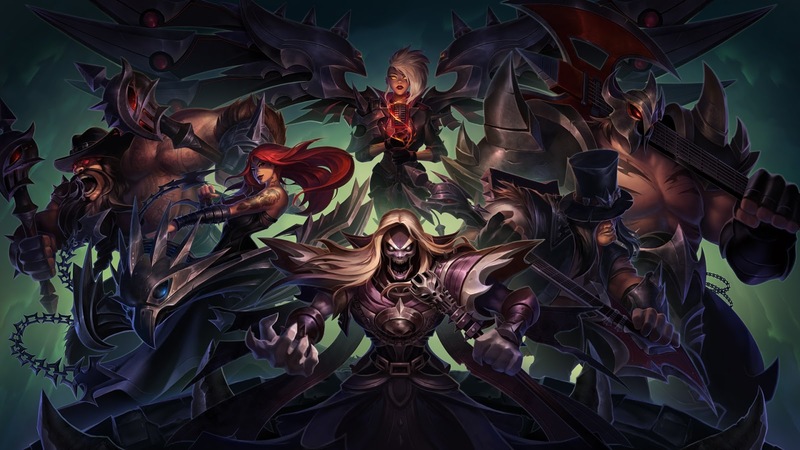 Pentakill's latest album, Grasp of the Undying, is now available for streaming on the Pentakill website! 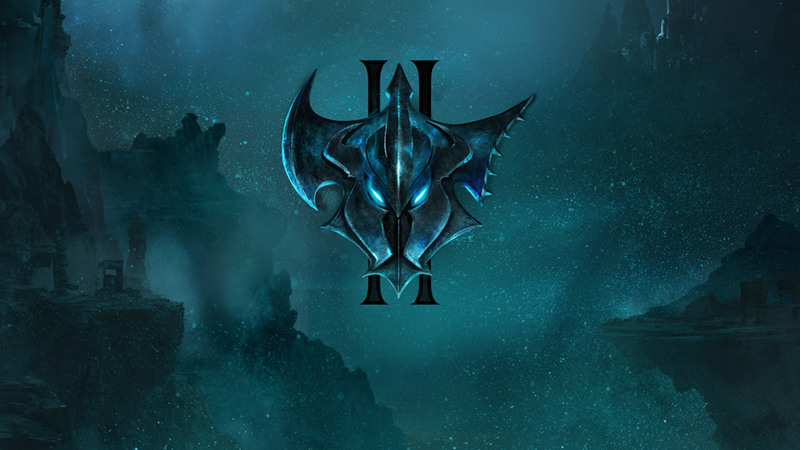 After the release of the music video for Mortal Reminder, the Pentakill site has been updated with the full 10 tracks on the new album, Grasp of the Undying! 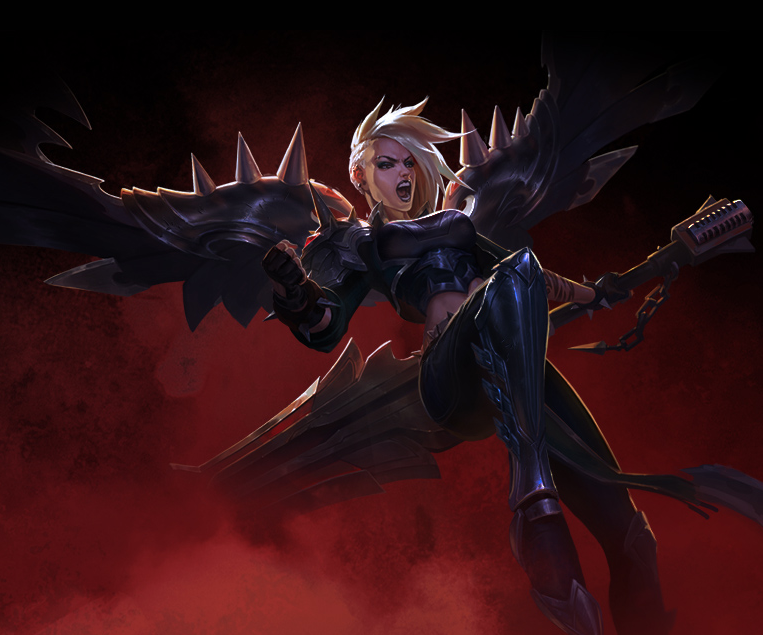 The site also includes a look at the band, with a release date for Pentakill Kayle of 8/9/17! These tracks will also be available on music sites like Spotify and iTunes for streaming tomorrow, 8/4/17! When the sky in the far north of the Freljord grows dark, and warriors gather around the hearthfire embers, they sometimes speak of a deathly night on the ice, of murderous rage unbound. It is a tale only spoken of in hushed, awed whispers. Some claim it is no more than a legend invented to frighten youngsters, others claim that even to speak of it is to invite the return of those metal warriors from their tour of the realms beyond. None lived to tell of this grim night, but sometimes a reckless taleteller speaks of a berserk axeman reaping lives with his axe. They whisper that not even his brothers could restrain his fury. Only by bringing a mountain down upon the metal giant was his rampage halted. THUS DID PENTAKILL’S LAST LIVE PERFORMANCE END. Accounts of Kayle’s arrival in Runeterra variously speak of her borne by a fiery comet that split the sky, or straddling the girth of a glittering, serpentine dragon. These are just two of the legends of how Kayle came to walk among mortals. Gleaming in jagged warplate, she was a golden warrior goddess from a strife-torn world in search of allies to fight an epic war against the diabolical hordes of her faithless sister. Planet Earth had failed to produced warriors of mettle, so she travelled to Runeterra in search of warriors of metal. 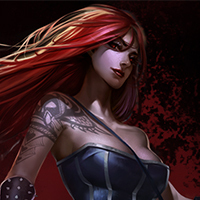 So rarefied was Kayle’s divine speech that she could only communicate via grand, symphonic metal operas that told of her plight. The depthless sorrow of these operatic arias pierced the hearts of all who heard them and her listeners were frequently overcome with such overwhelming melancholy that they simply dropped dead at the end of her performance. But since each song was typically many hours long, they had time enough to put their affairs in order before death took them. Yet for all the heart-rending emotion contained in her lyrics, none of her audiences could truly understand the depths of her woes, no one could hear the sorrow of her existence without immediately perishing. After the disastrous end to their last live performance, where Mordekaiser destroyed the entirety of the Freljordian crowd, Karthus gave the fateful order for Olaf to drum the “Worldsplitter Rhythm” that sundered the land and brought down the icy realm’s highest peak upon Mordekaiser. As the rock of the mountain cascaded down, the band fled to the far corners of Runeterra to escape the wrath of Freljoridan battle queens and the raft of inevitable blood feuds. 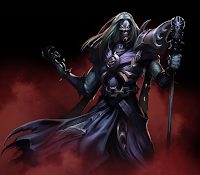 Karthus pitched up in Bilgewater, earning a crust as a hooded reciter of funeral dirges. This had an unexpected health benefit to natives of Bilgewater, as people started looking after themselves rather than have to put their families through such an ordeal. So Karthus toured the most squalid and foetid dive bars to sing at the drunken wakes of murdered pirates instead - what with grim dirges being a vast improvement on sea-shanties. A slow descent into madness and obscurity beckoned until the radiant form of Kayle arrived in Bilgewater. 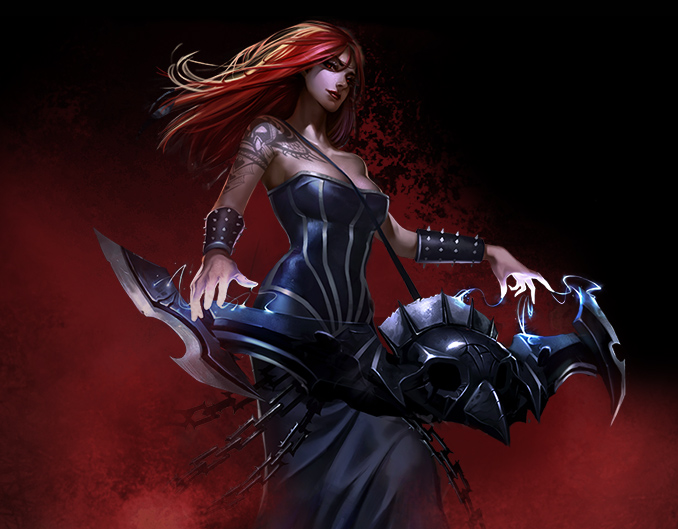 She heard the depthless well of misery in his despairing lyrics and knew Karthus alone could understand her own sorrow. What followed was a drunken woe-off, a night of debauchery, gothic poetry and operatic singing that saw the men and women of the Slaughter Docks hurl themselves into the monster-filled ocean rather than listen to their maudlin duets. In the aftermath, Karthus and Kayle pledged the Vocalist’s Oath to return stronger than ever. After all, shared woe is better than solitary woe. IT WOULD BE THE COMEBACK TOUR TO END ALL COMEBACK TOURS. The hooded and hunched figure of Yorick headed south from the bloody carnage of the Freljord and did not stop until he reached the sun-bleached wastes of Shurima. Sunlight was something new to Yorick, something he avoided for fear of people recoiling from a face not even a mother could love. He helped excavate the tombs of long-dead emperors, which allowed him to spend a great deal of his time in the darkness underground - something his fellow diggers certainly appreciated. His unique bass was the perfect tool to crush the soft rock of Shurima, but often had the side effect of liquefying the sand to a degree where many of the workers excavating the tombs were buried alive. To many of these buried souls, this was preferable to enduring another moment of conversation with a man who could literally bore rock. 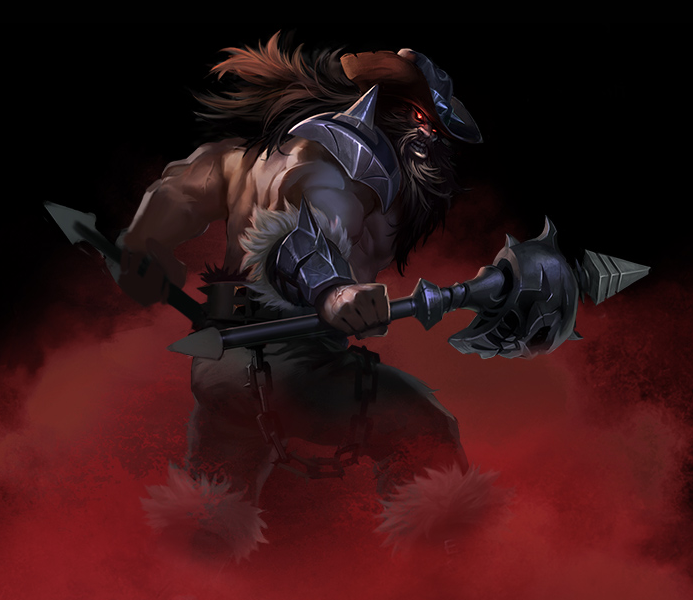 After being forcibly ejected from dig sites all across Shurima and months spent deep underground with long-dead princes, Yorick decided that he too desired to be buried in the sands. He dug deep into the bedrock to craft his own shadowed mausoleum, and there he interred himself within a lightless tomb, intending to pass the aeons in splendid isolation. 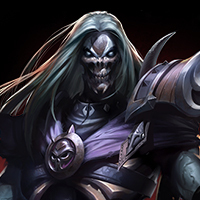 And so Yorick slept beneath the desert until Karthus and Kayle prised open his tomb. The two singers did nothing to disabuse Yorick of the idea that aeons hadpassed and that all who desired him dead were, themselves, now dead. THE MORTAL REALM WAS, THEY TOLD HIM, ONCE AGAIN READY FOR PENTAKILL. The entombment of Mordekaiser beneath the mountain of Freljord had inspired Sona, and while the other members of the band split to the far corners of Runeterra in despair, she was consumed with the desire to craft soaring, symphonic rock operas. She toured the grandest temples of the world (and beyond), but none of the acoustics were powerful enough to satisfy Sona’s need for the most cosmically resonant sounds. The great glacier temples of the Freljord were now denied her, so Sona took ship with the the doomed crew of the Serpent’s Feast to a series of volcanic islands in uncharted waters east of Bilgewater. The dread crew swiftly departed as Sona set up her keyboards and began to sculpt the island with sonic brutality. She played the very notes of creation and dragged volcanic islands from the depths as they rained lava to form titanic organ pipes to further magnify Sona’s playing. So powerful were her notes that they travelled between worlds and sank entire continents (a planned gig in Atlantis had to be cancelled). Encircled by mighty volcanoes, Sona set the sky ablaze with hellfire dragged from the heart of the planet. Yet, as awesome as it was, her playing needed more. It needed the demonic wailing of unearthly guitars and the quaking thunder of drums and bass. AND THAT’S WHEN THE BURNING FERRY BEARING KARTHUS, YORICK AND KAYLE RAN AGROUND ON SONA’S BASALT RING OF FIRE. Though it went against every instinct he possessed, Olaf did not stay and die under the mountain with Mordekaiser. With Yorick heading south, Olaf’s favourite drinking partner was gone. So, to mourn his survival of what he always believed was to be his final performance, he sought to drink himself to death with the deadliest booze of Runeterra. 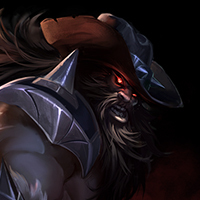 He found a fellow named Gragas, and ended up in the depths of Zaun with him, drinking potent sump cocktails, bragging of his glory days and daring chem-jacked thugs to take him on. He readily found ways in which to ply his trade as a professional hitter of things, and soon found himself embroiled in underground golem fight-clubs. Up against chem-powered golems, Olaf found his natural talent for pounding drums was also good for pounding mechanical giants to pieces. 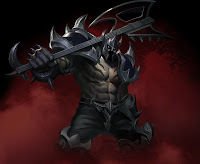 He sought out the most dangerous opponents in fight after fight, eventually falling under the metal hammer of Drago, one of Viktor’s most lethal creations. Just as his foe was about to deliver the deathblow, a piercing wail shattered the crystalline globe containing the golem’s transplanted brain. Bellowing in rage at this denial of death, Olaf surged to his feet, ready to pound again. He found himself face to skull with his old lead singer. OLAF WOULD LIVE. AND HE WOULD DRUM AGAIN. 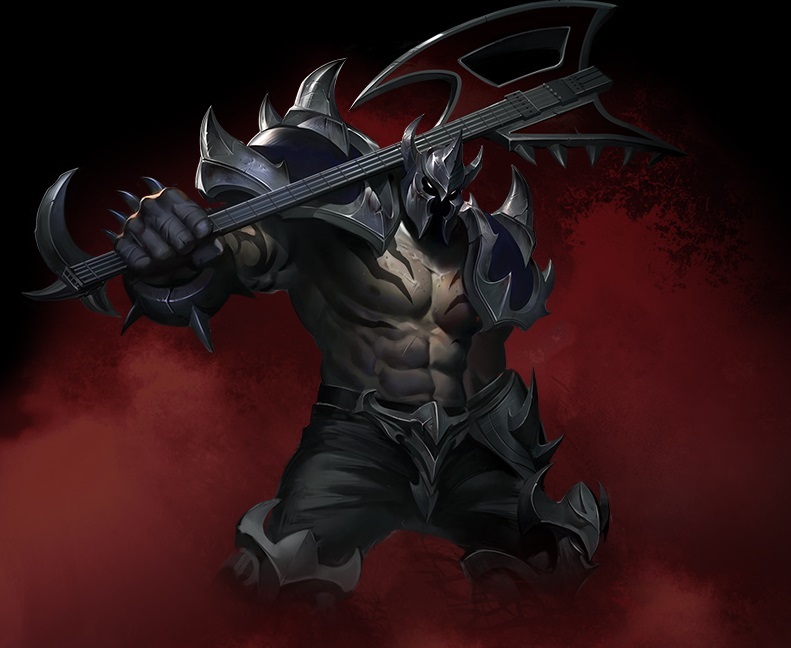 When the mountain fell on Mordekaiser, he took it as a sign from the Gods of Metal that his demonically-ordained task to bring metal to the masses was done, that he had achieved full Metal. His power chords had so shredded the very fabric of the world that the universe smote him with a mountain. A fitting end to the high priest of metal. But Mordekaiser knew he would be reborn, rising from the molten ruins of the fallen peak as the once and future king of metal. But as time passed, his wait became a slumber. The crushing mountain was shunned by those who lived in its dark shadow, an evil peak of black metal and cursed rock. Upon its highest summit, the gleaming, obsidian haft of a snarling axe protruded from the rock. Legends grew around this cursed place, legends telling that whosoever drew the axe from the mountain would be the one to reunite the heralds of a new age of metal. When the mountain finally shuddered and fell, a brazen god of rock was revealed. 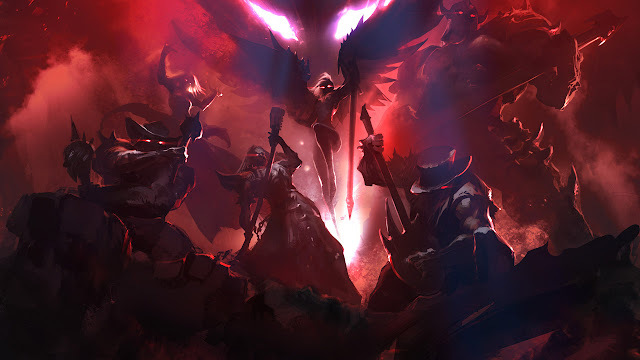 As Mordekaiser rose to meet the giant who had drawn the axe from the rock, he saw his old bandmates accompanied by a fiery, hellion-valkyrie from beyond. 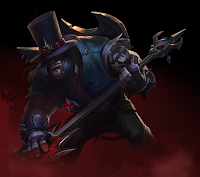 Karthus held out his axe, its razor strings shivering with anticipation. “THE BAND’S BACK TOGETHER,” SAID THE DEATHSINGER. 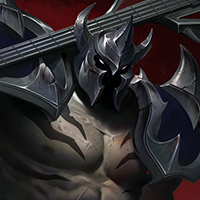 When a mountain fell on Mordekaiser, he took it as a sign from the Gods of Metal that his demonically-ordained task to bring metal to the masses was done, that he had achieved full metal. He knew he would one day be reborn, but as time passed, his wait became a slumber. The crushing mountain was an evil peak of black metal and cursed rock. Upon its highest summit, the gleaming, obsidian haft of a snarling axe protruded from the rock. Legends grew around this cursed place, legends that foretold whosoever drew the axe from the mountain would be the true herald of a new age of metal. Karthus embarked on a solo career in Bilgewater, earning a crust as a hooded reciter of funeral dirges. This had an unexpected health benefit to natives of Bilgewater, as people started looking after themselves rather than have to put their families through such an ordeal. Karthus made a career touring squalid dive bars to sing at the drunken wakes of murdered pirates instead - what with grim dirges being a vast improvement on sea-shanties. Thinking he’d try something new, Yorick chose to vacation in the sun-bleached wastes of Shurima. Sunlight was something new to him, something he normally avoided for fear of people recoiling from a face not even a mother could love. His unique bass was the perfect tool to crush the soft rock of Shurima, but often had the side effect of liquefying the sand to a degree where many of the workers excavating distant tombs were buried alive. To many of these unfortunate souls, this was preferable to enduring another moment in the presence of a man who could literally bore rock. Sona was consumed with the desire to craft soaring symphonic rock operas and tour the grandest temples of the world (and elsewhere) but no acoustics were powerful enough to satisfy her need for the most cosmically resonant sounds. Sona took ship with the the doomed crew of the Serpent’s Feast to a series of volcanic islands, and began to sculpt the island with sonic brutality. There she unleashed the music of creation. So powerful were her notes, they travelled between worlds and sank entire continents (indeed, a planned gig in Atlantis had to be cancelled). After surviving what he believed was to be his final performance, Olaf sought to drink himself to death with the deadliest booze of Runeterra. He ended up in the depths of Zaun, drinking potent sump cocktails, bragging of glory days and daring chem-jacked thugs to take them on. Olaf soon found himself embroiled in underground golem fight-clubs. Up against chem-powered giants, Olaf found his natural talent for pounding drums was also good for pounding mechanical automatons to pieces. A golden warrior goddess from a strife-torn world, Kayle arrived in Runeterra on the back of a glittering, serpentine dragon. 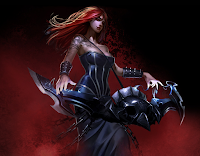 She searches for allies to fight an epic war against the diabolical hordes of her faithless sister. Planet Earth had failed to produce warriors of mettle, so she travelled to Runeterra in search of warriors of metal. Communicating via grand, symphonic metal operas, the depthless sorrow of her arias pierce the hearts of all who hear them. Literally. There are champs like Twitch and Sona, who don’t require much skill, and then there are champs like Azir and Ryza, who are practically impossible to play. What do you plan to do to bridge the imbalance gap between these champs?